A new poll offers insight on which characteristics drive support and opposition. What personal characteristics and attributes matter most in shaping voters' views about the likely 2016 presidential candidates? The latest NBC/Wall Street Journal national survey released last week offers some important clues. The poll asked registered voters to rank Hillary Rodham Clinton, the Democratic frontrunner, from 1 (weakest) to 5 (best) on a series of personal attributes. Clinton scored highest for "being knowledgeable and experienced enough to handle the presidency" and worst for "being honest and straightforward" with the verdict falling in between for other qualities, such as "being effective and getting things done" and "being compassionate enough to understand average people." Public Opinion Strategies, the Republican polling firm that codirects the NBC/WSJ survey with Democratic firm Hart Research Associates, provided Next America with results showing how voters who gave Clinton good, poor and equivocal ratings on those attributes then divided between her and Republican Jeb Bush in a potential 2016 match-up. 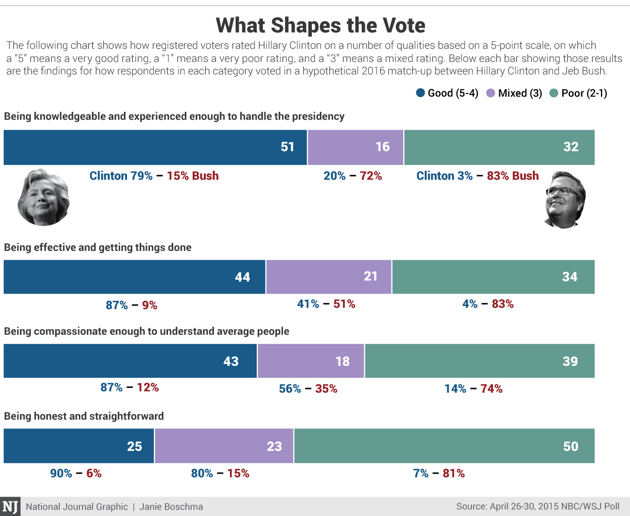 Most intriguing may be the results among those who offered an ambivalent assessment of Clinton, providing her the 3 rating in the scale's midpoint. About 1 in 6 voters gave her that equivocal rating for being knowledgeable, and they preferred Bush by 72 percent to 20 percent. About 1 in 5 provided her that middling grade for effectiveness, and they also preferred Bush by a 51 percent to 41 percent margin. But among the just under 1 in 5 who gave Clinton mixed marks for compassion, the former first lady led 56 percent to 35 percent. Perhaps most striking is that nearly 1 in 4 provided her with a conflicted 3 rating for her honesty; yet those voters preferred Clinton over Bush by 80 percent to 15 percent. In one sense, these results quantify an obvious point: Clinton (like any politician) is far more likely to win support from voters impressed with her personal qualities than voters who are dubious of them. That means that she has a clear stake in preventing doubts about any of her attributes from spreading or solidifying too deeply. But the results also suggest that even many voters with doubts about any one of Clinton's qualities—particularly her honesty—are still open to supporting her. Other personal attributes may matter more. So may her views on issues, perceptions about the parties, or judgments about the country's direction. The lesson may be that no silver bullet will safeguard her candidacy, and no single stake will slay it.